Whether you are vegan or allergic to egg products, an egg free cinnamon bread is a sweet treat that is simple to make. You can easily make either a yeast or a quick bread version to suit your tastes, time, and abilities. Most yeast cinnamon breads do not need eggs in them. The yeast supplies all of the leavening required for rising and texture. It is easy to just leave the eggs out in almost any cinnamon yeast bread recipe. You may want to add an extra tablespoon or two of oil since egg yolk does have a significant amount of fat. Place the yeast in the water and add the honey. Stir well and let stand until it gets foamy, about ten minutes. Add the yeast to the milk and salt; stir well. Stir in one cup of the flour to make a soft batter. Let rise about 15 minutes. Stir down and mix in the rest of the flour until the dough leaves the sides of the bowl clean. Turn out on a floured surface and knead for 10 minutes, until the dough is smooth and elastic. Place in an oiled bowl and let rise in a warm place for about an hour, or until doubled. Roll out each half into a rectangle about nine inches wide. Brush each rectangle with the melted butter. Mix the cinnamon and brown sugar together. Sprinkle the rectangles with the cinnamon and sugar mixture and then roll up like a jelly roll. Place in greased bread pans and allow to rise until double, about 45 minutes. Bake the cinnamon bread for 30 minutes or until the top is golden and it sounds hollow when tapped. Allow to cool for 10 minutes in pans and then turn out to cool completely. You can easily substitute soy milk, almond milk, or water for the milk called for in the recipe. To make a completely vegan product you can also substitute the butter with a light oil or soy margarine. You can also make an egg free cinnamon bread for a quick breakfast using baking powder as the leavening. Grease an 8 inch loaf pan and set aside. Stir the flour, ¾ cup pf sugar, baking powder, salt, and cinnamon together until they are well blended. Set aside ½ cup of the crumbly mixture. Add the milk to the remaining mixture and stir well. Sprinkle the batter with the ½ cup of crumb mixture. Bake for 45 minutes, or until a knife inserted in center comes out clean. You can add a half a cup of nuts or raisins if you like. Use almond or soy milk and margarine for a completely vegan product. If you don't consider yourself much of a baker, you may want to consider buying vegan baked goods locally or online. A number of alternative grocers like Whole Foods carry vegan items of all sorts, and even create them in their in-store bakeries. While these online bakeries may not always have cinnamon bread in stock you can often make a special request. 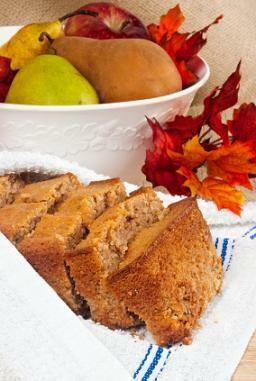 Cinnamon bread, like banana bread is a special treat for breakfast or a light snack. It is simple to make and there is no reason why you can't enjoy it, whether or not you eat egg products. The simplest way to make anything eggless is to replace the eggs called for in the recipe with the recommended amount of egg replacer. If you need some ideas for egg replacers you may be interested in this slideshow of egg substitutes.